Folding@home user builds forty six GPU folding farm, processing a mind blowing 265,200 point per day! BFG Tech has released versions of the popular 8800 GT and 9600 GT with a difference: a completely redesigned cooling solution. We find out how effective it is, and how much more performance BFG has squeezed out of these mid range boards. 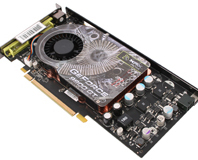 XFX debuts its GeForce 8800 GT 256MB - it's just like the 8800 GT 512MB, but with less memory!